15th January marks the birth date of Dr. Martin Luther King, beloved by many around the world, and especially in the USA by all peoples, and especially by Americans- USA people of African descent. 16th January marks the anniversary of the signing of the Peace Accords, that put an end to the armed struggle in El Salvador. Salvadorians were and still struggling for the same human rights as impoverished peoples of the USA. Impoverish-ment and the dream for a humane, caring society that is centered in the care of peoples and the planet, still is a dream that we must be about, in an urgent way, for the numbers are increasing daily all over the world. Today the industry of Cloud Security, to secure industrial documents, is really increasing into the billions of US dollars, and the same is happening with respect to the new digital currencies, the bitcoins, there is that kind of security, while on the other hand, millions of peoples going into the billions are unemployed and suffering extreme weather disasters, violence, organized crimes, famine and forced migrations. What then is real, and also shared security? And also we find that there are people in high levels of “development international agencies” who deny the deep impact of history and culture on the lack of real peace and development. They state that colonial, neocolonial experiences, the international division of labor, sexism, racism, coup d’etats, military interventions, dictatorships—are all of the past and do not have to be factored in, to solve the lack of development of peoples and nations, nor the financial and economic crisis. Today I have the privilege of sharing with you a reflection on Martin Luther King’s dream, for us to be inspired and guided, and for us to renew our commitment to not let go, and to make sure that it happens in our lifetime… it is demonstrated that it can happen. Leo, the author, is an African American pastor, not an activist, but a person actively committed to work intentionally to bring about this dream, let us join with him on this path. Reverend Leo Woodberry and Rabbi Marc Kline Every year we gather to celebrate the life and accomplishments of the Reverend Dr. Martin Luther King on his birthday. We speak of his “Dream” of a world where we protect each other’s dignity because we share the same divine parent and not just the same religion, skin color, language or gender. We would be remiss if we did not notice that his dream is far from realized. We would further be remiss if we did not notice that one of the greatest obstacles in the way of fulfilling his dream is the way in which we have forgotten the rest of his speech that day in Washington, D.C. He dreamt of a day when “the sons and daughters of slaves and former slave masters …” would co-exist in harmony and with dignity. His dream was not limited to racial equality. His dream was far more encompassing. As he marched for racial justice, he marched against the proliferation of war. His was not a message for African Americans alone, nor was it a call only to Christians. He taught that God was the God for all people of all colors and all faiths. He prayed for peace and for justice for all people, of all nations, on all fronts. That people use him exclusively as a Christian or an African American serves only to diminish the magnitude of this man’s prophecy and ignore history. This Minister of the gospel understood all too well that God was not limited to the protection and love of one religion or one race. Yesterday, it was Vietnam, today it is the Middle East, the Philippines, Afghanistan, and Iraq . Yesterday, there were lunch counters for white and for colored, today there are bank standards, club memberships, and educational / economic opportunities for the haves and have nots. Yesterday, the nation feared the Red Scare while today, Democrats fear the Republican scare and Republicans rail against the Democratic illegitimacy. Yesterday, the doors were opening for equal opportunity, and today our government is calling to do away with the tools that provided that access. The world today is just as filled with strife, as it was when Dr. King lived and struggled for the cause of peace and justice. In the 1960’s, African Americans cried out about discrimination and the abortion of human rights. Today we hear echoes of the same cries from Arab-Americans and from Hispanic-Americans. In the current administration of President Barak Obama, the use of “race” as a divisive tool threatens and has helped to split the country. How much are we truly committed to the dream? 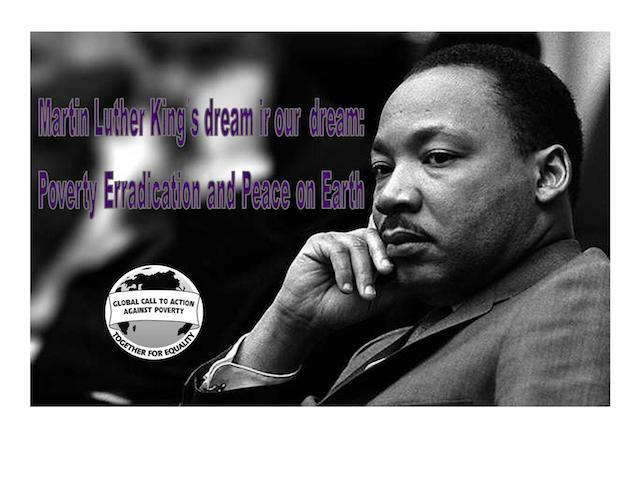 Dr. King said in his time that we were facing a triple revolution: a revolution in human rights, technology, and weaponry. How have we honored the Dr, King’s call to protect and proliferate the inalienable rights to life, liberty and the pursuit of happiness? Sometimes we just do not pay attention. When biological and chemical weapons fill the storerooms and arsenals of democratic nations (including our own) as well as terrorist labs, how committed are we to the dream? We live in a world where bank accounts of the wealthy and the rolls of the impoverished are growing at a similar pace. We have become so focused on security from outside terrorism that we have looked past the abusive corporations that have pillaged the security of people’s savings and futures. The bomb takes lives of loved ones. The economic terrorism of an abusive corporate world has destroyed more lives and communities than any suicide bomb. Every time we forget that fulfilling the dream is rooted in the very real and intentional work of undoing the sense of privilege that has found its way into every nook and cranny of our American culture, we have to question where Dr. King’s message went awry. And every time that Dr. King’s words are used to support the elevation of one people, even a minority people, over another, we have missed the point that there can never be peace when one wins at the expense of another’s loss. Racism is real. Reverse racism is also real. And the voices that proliferate this divide, who profit and become more powerful as a result of this divide rule the airwaves with talk shows that are “too liberal” or “too conservative,” but always divisive. Whether it’s the inflammatory sermon of clergy or the brow beating of a candidate with the assessment that his candidacy is only about his race. America does not win. We do not win. This is not a zero sum game that for us to prosper someone else has to lose, and yet, we treat our country as though our success must be rooted in our neighbor’s failure. So long as our success is rooted in anything other than our hard work for the betterment of our lives and our community, so long as it is enough to beat the next person such that growth need not be an issue on our table, so long as our sphere of concern relegates a concern for ethics and justice to a position secondary to our prosperity, we have not fulfilled Dr. King’s dream.